"My initiatives like Swachh Bharat, building toilets, opening bank accounts among several others were questioned by the Opposition. Those raising questions must know that the big revolution is brought with little things," said PM Modi. Dandi: Prime Minister Narendra Modi dedicated the National Salt Satyagraha Memorial in Gujarat’s Dandi, to the nation on Wednesday on Mahatma Gandhi’s death anniversary. Addressing the gathering, he lashed out at Opposition saying every scheme and initiative announced by him were questioned. “My initiatives like Swachh Bharat, building toilets, opening bank accounts among several others were questioned by the Opposition. Those raising questions must know that the big revolution is brought with little things,” said PM Modi. 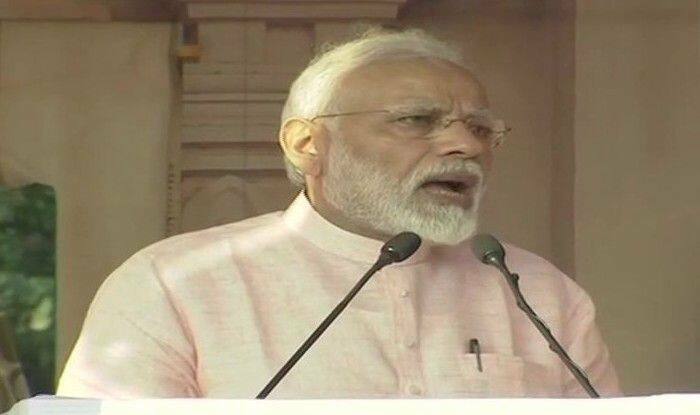 Stating that those who opposed the Swachh Bharat scheme did not care for the poor, the Prime Minister said the country will not forget the dialogues of the Opposition. He added that even ‘Bapu’ regarded cleanliness or ‘Swachhata’ more and kept it above freedom and added that his government was marching ahead on Mahatma Gandhi’s path. He further said that this year’s Republic Day parade was a tribute to Gandhi Ji. The theme of the tableaux this year revolved around the 150th birth anniversary of Bapu. The National Salt Satyagraha Memorial has statues of Mahatma Gandhi and 80 Satyagrahis who had marched with him during the historic Dandi Salt March. It also has 24-narrative murals depicting various events and stories from the historic 1930 Salt March. The Salt Satyagraha March, better known as ‘Dandi March’, was a landmark event in the freedom struggle. As many as 80 Satyagrahis led by ‘Bapu’ marched from Sabarmati Ashram in Ahmedabad to the coastal village of Dandi and made salt from seawater, thus breaking the Salt Law imposed by the British. PM Modi laid the foundation stone for expansion of the terminal building of Surat airport earlier in the day. The new terminal building will be spread over a whopping 5,500 square meters and constructed at a cost of around Rs 354 crore. It is also proposed to be an eco-friendly building that would lit up with of solar energy and LED lighting.